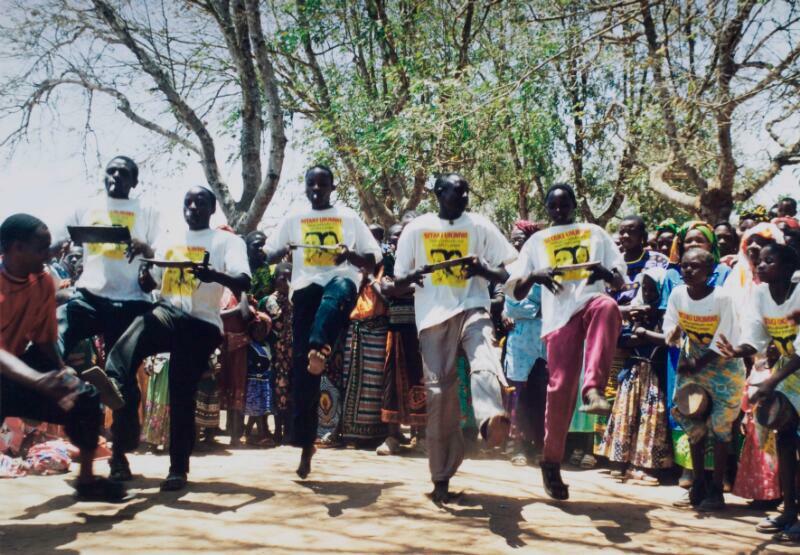 These young men are performing a dance in order to spread a health message about trachoma, an infectious eye disease, to their community in Tanzania. They are holding cards which they are using as musical instruments. The men have been provided with T-shirts (although the event is about trachoma, the T-shirts are about HIV/AIDS). Events such as this can be extremely effective in attracting large numbers from the community to listen to health education messages. Successful health promotion campaigns need effective health communicators who can deliver health information messages clearly and accurately. Provision of non-financial rewards such as T-shirts can help to motivate health promoters.